First Hit of the Year. Today is Friday, but the best day of this week clearly was Wednesday!!! The post about dead bees was a bummer so I was in search of good news. Being out and about, I decided to check some swarm traps. Trap18 is in a place I referred to in Looking for Spots. A neighbor of the landowner had bees many years ago, but no hives have been kept in the area for 15-20 years. There is a colony in a large sycamore about 300 yards from where this trap is located. The land owner claims they have occupied that tree for at least the last ten years. Those are my kind of bees! It’s not a sure thing yet. There was no pollen entering the trap, so there is still a slight chance they could leave. This happened several times last year. I would get pictures from a landowner’s cell phone showing a swarm amassed on a trap only to find it empty a couple of days later. Maybe they change their minds in favor of a different location or lost their queen. I don’t know why, I just know it happens. I shot some video of the bees around the trap, but the landowner was weed-eating about 75 yards away. In the video it sounded like I was running both the camera and the weed-eater at the same time! The camera seems to pick up “engine type” noises, making them VERY LOUD when in the back-ground. I will get video of the next one. It is a beautiful thing, and a picture just doesn’t do it justice! I will be checking 20 some other traps over the next three days so hopefully more to come. 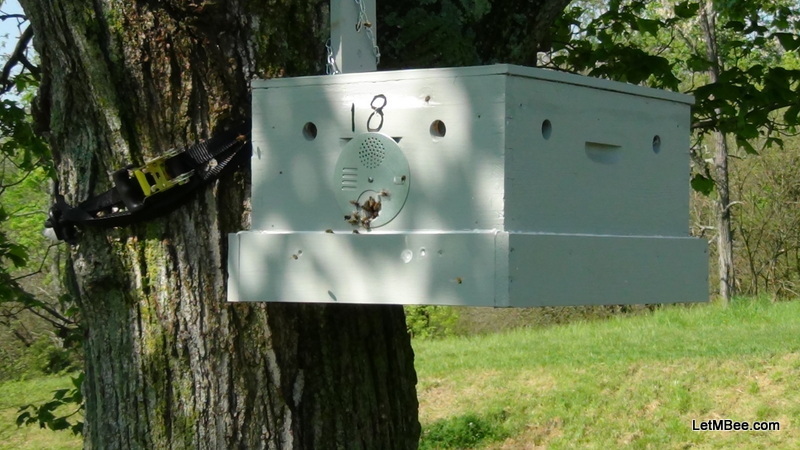 This entry was posted in Feral Bees, Posts, Swarm Trapping, Uncategorized and tagged bait hive, bee, bee genetics, bee tree, beekeeping, feral bees, feral hives, Indiana beekepeing, Jason Bruns, Swarm, swarm trap, swarm trapping. Bookmark the permalink. 3 Responses to First Hit of the Year. Checked a bunch of traps today. Trap 18 is a definite catch now. Two other traps were hauling in pollen as well. Yet another I predict will have a swarm on it before the weekend is over. They were giving it some serious scouting attention. It is a great way to obtain bees! lol no kidding I only have three traps up so far, what are dimensions of your trap boxs? I’m using 2x warre boxs per trap atm.